Fillet and remove bones from the arctic char. Slice ginger and split and scrape vanilla bean; peel orange. Lightly toast bay leaves, juniper berries, coriander, cardamom, star anise, and cinnamon in a dry frying pan, then add orange peel and ginger and toss. Transfer to a mortar and lightly crush. Transfer to a large container along with salt, brown sugar, and vanilla seeds and bean. Toss to combine. Coat fish in the spice mixture, cover with plastic wrap, and let marinate for approx. 1 – 1.5 hrs. To make the beetroot reduction, mince shallots. Heat a saucepan over medium heat and add lime-olive oil. Add shallots, and sauté until fragrant. Add brown sugar, bay leaf, and cinnamon and cook until the sugar is caramelized. Deglaze sugar with orange juice and gently simmer for approx. 5 – 10 min. Add beetroot juice and continue to simmer until it is reduced by half, approx. 15 – 20 min. Strain through a sieve into a new saucepan over low heat. Combine cornstarch and water in a small bowl to make a slurry, then add some of it to the beetroot reduction to thicken. Season with salt and sugar to taste, then add the juice of the lime. Set aside. Preheat oven to 170°C/350°F. Finely chop walnuts. Combine the butter, flour, sugar, and salt together with walnuts to make a crumble. Spread over a baking sheet lined with parchment paper. Bake for approx. 10 – 12 min. until the crumbles are golden brown and crisp. Set aside to cool. For the citrus salad, wash and dry the oranges, lemons, and lime. Peel oranges, lemons, and lime and fillet; set aside. Squeeze juice from the remaining piths into a small bowl. Add brown sugar and lime-olive oil to a saucepan over medium-low heat and caramelize. Add orange juice and fresh citrus juice to the pan and simmer until the mixture is reduced by half; add some of the slurry to thicken. Remove from heat. Stir in citrus filets and zest, then season with salt and honey to taste. Remove fish from marinade and rinse in a water bath. Cut into bite-sized pieces, and arrange 3 per plate, alternating with citrus filets. 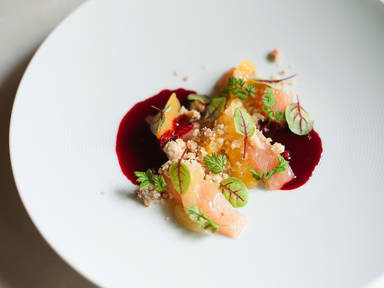 Top with walnut crumble and garnish with chervil, sorrel, and the red beet reduction.